Blowout Sale! 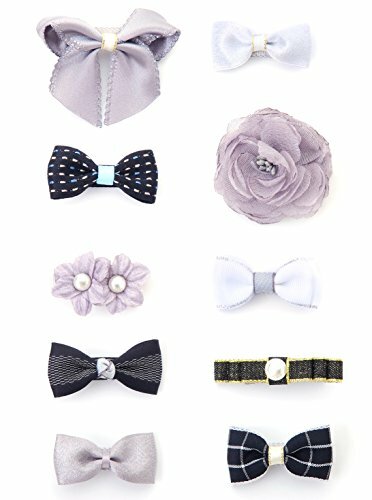 Save 56% on the Belle Beau Baby Girls Hair Bows, Hair Clips, Ribbon Lined Alligator Hair Clips (Z-Dix-B) by Belle Beau at Metro Atlantic. MPN: ZC1560. Hurry! Limited time offer. Offer valid only while supplies last. ORIGINAL AND TRENDY DESIGN---Belle Beau baby hair bows are the perfect accessory to dress a baby girl. Belle Beau designs are always original, trendy, and fashionable. This new 10-piece set of baby hair clips is made up of 10 different designs, all color-coordinated. The clip base measures 3.5 cm/1.38", fits for baby girls, toddler girls best. HANDMADE WITH LOVE AND CARE---Every piece of our bows is handmade by a group of mommies with a lot of passion,love, patience and great care. We use high quality materials, right from the fabric, ribbon, clips, and glue to every other part that is used in making the best baby girl accessories. Quality is the most important component we build into every piece of bows we make, so Belle Beau hair clips won't come apart easily when pulled on or played with. DESIGN FOR COMFORT AND SAFETY---"No pull,No damage, No hurt" is our promise to young babies. Every clip base is carefully lined with soft and high quality ribbons. You will never worry about your baby's comfort and safety when you are trying to dresses your baby girl. EASY TO USE---Pinch the clip open, slide some hair of your baby and release. You can use it to pin your baby's bangs back to keep the hair out of your little one's eyes. Our clips are perfect for fine or thick hair, or anything between. PRETTY PACKAGING-----This hair clip set is beautifully packaged, so it's excellent for gift giving! If you have any questions about this product by Belle Beau, contact us by completing and submitting the form below. If you are looking for a specif part number, please include it with your message.